While I do of course enjoy doing my capsule reviews I will sometimes spotlight a single issue of a comic that particularly tickles my fancy or perturbs me with its terrible quality. Well, I have a single issue of a new comic I want to discuss and it is for positive reasons of my really loving it! 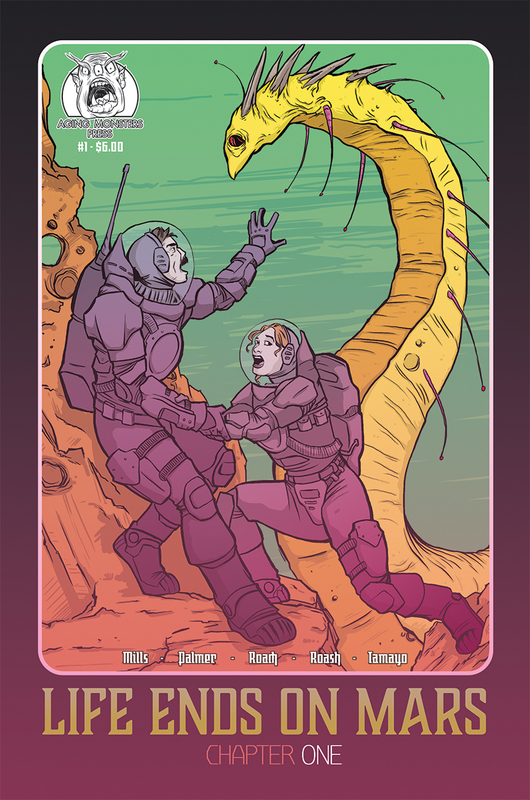 The comic is the debut issue of, "Life Ends on Mars." Readers of the blog may recall I mentioned picking-up this comic from Aging Monsters Press and that I was eager to read it. The concept sounded really cool to me and it thankfully reads as well as the premise. Basically the idea is that it is the future and Earth is quite ruined. All the port cities have ended-up underwater because we as a planet couldn't stop our destructive tendencies and now it's up to big business conglomerates to save us all with an effort to terraform Mars. Yeah, it already sounds like we're doomed if the potential for salvation is in the hands of corporate stockholders. Nova Mundi is the name of the corporation, and it has a number of astronauts and scientists who are working for it at making Mars habitable because Earth has maybe 30, 40 years at most left before the whole damn planet is an unlivable cesspool. After a prologue that takes place towards the end of the story and hints everything went terribly wrong, there is a cool scene where two scientists talk about how all the old movies take place in cities that no longer exist. It is a depressing and stark reminder that if we don't get our act together in the present day this sci-fi concept of trying to colonize another planet could very well end-up having to be considered. From there on we see the scientists trying to make Mars friendly to human life arguing with corporate and struggling to get things working without the storms from their newly created atmospheres destroying the very tech making a potentially breathable air. After that we witness a conference call and start seeing hints of how something is horribly amiss on Mars as clearly some people wind up missing and probably dead. The guys over at Aging Monsters Press know how to make a solid first issue of a comic. It establishes the setting, gives us plot, introduces an assortment of characters, and hints at lots of death and destruction commencing soon. Too often I have read a first issue of a book that fails to grab me because it lacks these elements or is horribly decompressed and slow to actually get going. "Life Ends on Mars," thankfully both gives us lots of information and moves the plot along at a good pace that kept me engaged. The artwork was great as well, showing a clear and clean design that matched the futuristic theme. and the coloring fits delightfully too. "Life Ends on Mars #1" is a fantastic read and one I would recommend purchasing it! It was a good sci-fi story with a dash of horror and I'm eager to see just how bad things get for everyone on Mars! Note: A copy of, "Life Ends on Mars #1 was provided for the purposes of review with the understanding that if I hated it I would say so too (I always warn publishers I'll be blunt).